The Dynamite Trail is located in Gateway, Colorado at the mouth of John Brown Canyon. The town of Gateway hosts a dynamite shoot every year where people can enter the event and try out their skill at hitting a target that goes off with a big bang. As far as the Dynamite Trail itself goes, it pretty much serves as a connecting route to get to the Vista Grande trail, although it is nice to hike all by itself. The trailhead is located along 4.4 Road which is in John Brown Canyon. The turnoff from Highway 141 for 4.4 Road is just south of the Gateway Canyons Resort. From the trailhead the route leads across the wash and switches back a couple of times as it climbs the side of the little hill. 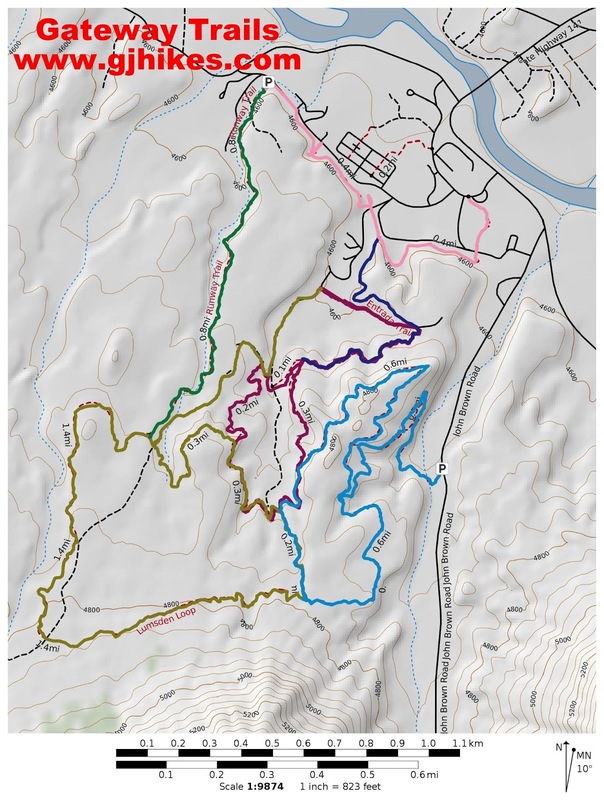 The trail, with its gentle slopes and easy transitions, was built with mountain bikers in mind but it is also open to hikers and horseback riders. As you can see, various shades of red and brown are the dominant colors in the area. The sheer cliffs of wingate sandstone, towering above the Dolores River valley, are among the features that attract visitors to this otherwise remote area. 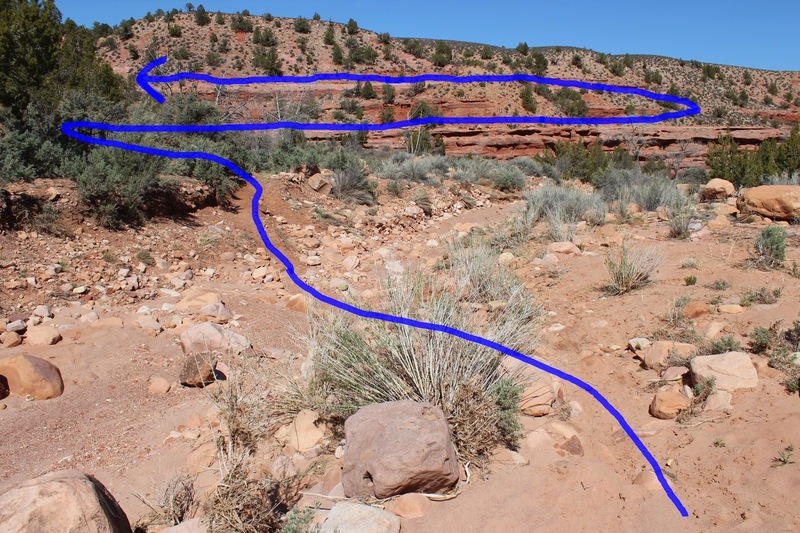 As you can see, the BLM did their usual great job of designing and building the trail to take advantage of the natural landscape. 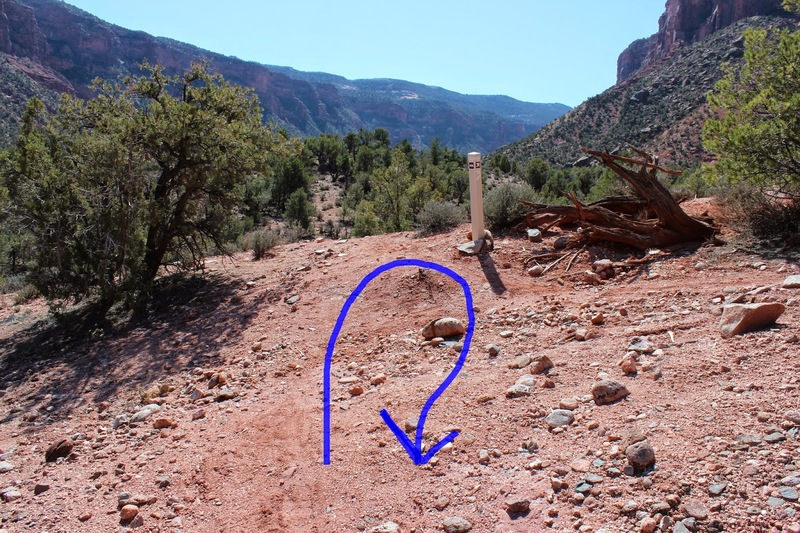 One has to marvel at all the dirt and rocks that are moved to turn an otherwise steep and treacherous slope into a fun and easy trail to hike and ride. Within less than 3/4 of a mile the Dynamite Trail meets up with the Vista Grande Loop that travels around the small upland mesa. 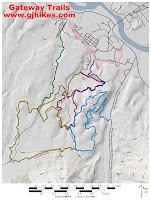 Here you have the option of lengthening the hike or heading back down the hill. As dry as the desert looks there are still numerous wildflowers like these bladderpod to attract your attention. The wildflowers start blooming here in March and by the middle of May many more are adding their colors to the mix. Visitors coming to the little town of Gateway get to drive through some of the most beautiful canyons in the world no matter which direction they approach from. Unaweep Canyon, to the north, is uniquely famous because it has two mouths. East Creek runs out of one end and West Creek runs out of the other. The Dolores River Canyon coming from the other direction is also a spectacular drive in itself with its high sandstone cliffs and the famous 'hanging flume' left over from the gold rush days. The Dynamite trail is a nice short hike while in the area. If you would like to see it for yourself then all you have to do is 'Take a hike'.